Fury Nano was released in Sep 2015 , it used the AMD Fury chip produced by TSMC 28nm and the card was only 175W TDP. It was the first high-end small form factor Graphics Card using the new HBM memory. Since then AMD havent released a Vega 14nm Nano card leveraging the increased perf/w characteristics of the new 14nm GloFo process. Now with the new Vega II produced using the TSMC 7nm process, I believe its the time to bring the Nano back where its belong. In order for the new Vega II Nano to have a better success it should have at least 8GB of memory and priced at $499 to compete against the RTX 2070. So, vote if you would like to see a Vega II Nano brought back to the market by AMD. Ok guys, would you like to include more options in the vote ?? Yes, somehting along the lines "No, AMD is not in a position to launch a Vega II Nano card". I don't have the time to explain this thoroughly, but the short version is Vega does have a Nano board being sold in fully fledged cards like the Sapphire Vega 56 Pulse. AIBs simply chose to not build a Nano Vega in the end. Well actually there is a Vega Nano card that i forgot about it. It is only made by Powercolor and its not officially released by AMD though. It could potentially be a good product, but I think Navi will make more sense to fill that void. I prefer cards with large, beefy coolers anyway, as generally I go mATX or ATX and want performance, not so much power savings or SFF. I want performance as well, but I also don't want a space heater in my system either. Which is why I'm hoping that AMD can get the power consumption and TDP under control with newer versions of Vega and the upcoming Navi. If you want to get excellent performance/watt, then buying a Vega card just doesn't make sense. I think even if AMD brutally cut the clock speeds, they still wouldn't be any more efficient than NVidia are already. I believe a Vega 2 at 175W TDP will be able to reach the RTX 2070 (GTX 1080/Vega 64) performance. We have this graph from the MI60 release(Vega 20). Since we can have the same performance of Vega 64 at half the power and since Vega 64 is at the same performance as GTX 1080/RTX 2070, then a Vega II at 175W TDP will be at the same performance. So we could have a Vega II Nano at 175W TDP that will be able to compete against the RTX 2070 (in non RT workloads) but at iTX format. Such a card could easily be priced at $499 and be a direct competitor to RTX 2070. Same performance, same power and Smaller Format at the same price vs the RTX 2070, this could be a winner. I'm sorry, but this is rather bizzarre They're pricing the main cards at 699 and not making many of those, partially because the ones they can make are much better sold into the compute market for $$$$. Why on earth would they take the chips, identify the ones than can down clock this much and still work well, do that and and start trying to sell them for $200 less? The place you make money, and lots of it, out of downclocked chips is in notebooks and this is just too big for those. And this is exactly what I mean from pro-AMD posters lately. I'm not surprised from AtenRa, but honestly. I'm not even in camp red anymore, but it feels like I'm more willing to support AMD than its current loyalist. A highly binned product from an already allegedly low stock product is going to sell for less!? Who thinks these things? Seriously, if this were even true, I'd figure the demand-to-supply for it would raise the price out the gate. I own NV stock because I can understand NV trying to make bank, and I must also own AMD stock because I was baffled anyone would think current AMD would sell a MI/Titan killer for $700! Vega 64 is completely uncompetitve against the RTX 2070 8GB, it has almost double the TDP, no RTX , more than a year on the market and with the Mining days gone. But, double the Memory and at a Small Form Factor = something RTX 2070 doesnt have = added value and differentiate your product over your competitor , something Vega 64 cannot do in any metric. Also, at a die size of 331mm2 you get approximately 170 dies per wafer. With 70% yields at 7nm we get close to 119 dies per wafer. With 12.000 USD per wafer those 119 dies cost $100. TU 106 is 445mm2 and you get approximately 125 dies per wafer. With 90% yields at 12nm we get close to 112 dies per wafer. With 8.000 USD per wafer those 112 dies cost $72. But since Vega II Nano has cheaper PCB (smaller + less complex) + cheaper cooler (smaller) , the BOM price difference of the end product (Graphics Card) will only be the extra cost of the 16GB HBM-2 over the 8GB GDDR-6. Even with the higher HBM 2 cost , a Vega II Nano graphics card at $499 will generate a substantial amount of revenue since it will be very competitive and will also raise consumer mind share with perf/w equal if not better to NVIDIAs competitor. A highly binned product from an already allegedly low stock product is going to sell for less!? ! You dont need a highly binned Vega II to create a 175W TDP Nano product. On the contrary you need less binning, more dies will work at 1.5GHz than dies at 1.8GHz. Also, AMD should EOL Vega 64 and Vega 56 and instead use the Vega II die to create a Vega II 56 Nano 8GB with 150W TDP that will compete against the RTX 2060 6GB at $349 (TU106 445mm2). A Vega II 56 Nano 8GB with a 150W TDP should be close to RTX 2060 performance and even higher when games will start to need more than 6GB of memory at 2K and 4K resolutions. It will also have better perf/w and BOM will be even cheaper because of the 8GB memory and even smaller cooler. This way with a single Vega II (331mm2) die they will cover all segments from RTX 2060 ($349) all the way up to RTX 2080 ($699). I think AMD needs a Vega Nano just to have a good reference point when it comes to efficiency over speed; all in an attractive form factor. Fury Nano was a weird card where it was fully unlocked, yet priced lower than Fury which was cut down a bit. I'm sure we have all seen how efficient Vega can be when properly tuned, but most users will not do that as it can be seen as a hassle. NVIDIA does something similar with their Max-Q lineup (okay, not that similar), showcasing how efficient their GPU's can be while retaining most of their performance. On a different note, Sapphire DID make a Vega Nano PCB allegedly, but a product never came to fruition. The Nano PCB is something that I would probably never be interested in myself, but c'mon it does look adorable. Its size enables so many cool form factors with a powerful GPU. I want a Nano PCB for every flagship card, no matter the color. Are the 7nm yields on a die that big (especially with tighter voltage bins) anywhere near 70%? Are you factoring in the cost of 4 stacks of HBM2? I doubt they could sell it at $500 and turn a profit. If they had that much flexibility, they would be selling Vega II at $600 and undercutting the 2070. Big 7nm die, 16GB HBM2, small production run, derivative of a card designed to be sold for $1000's. Wouldn't surprise me if they were already selling them at a loss at $700. 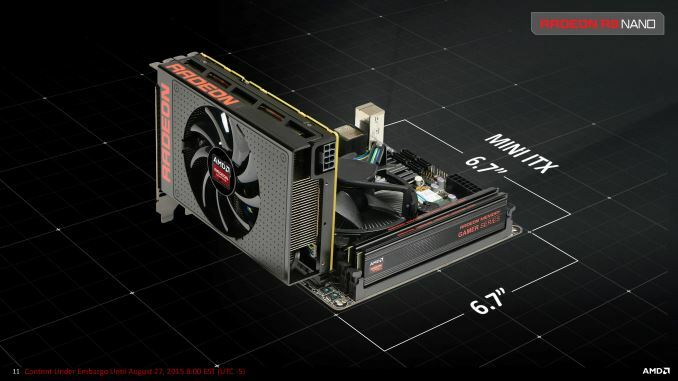 This is not the card to revive AMD's gpu fortune's, it's far too expensive to make - it's just there to give AMD something in that product range. It is not better to sell the $499 Vega II when they can sell a more-expensive Radeon Instinct instead. Who cares about RX Vega64? AMD has already sacrificed several MI50s to the consumer market just to maintain market presence until they finally launch Navi. Don't expect them to make more sacrifices. It is not better to sell the $499 Vega II when they can sell a more-expensive Radeon Instinct instead. Who cares about RX Vega64? AMD has already sacrificed several MI50s to the consumer market just to maintain market presence until they finally launch Navi. Don't expect them to make more sacrifices. You know how many Vega 20 dies they produced and how many of them have allocated for the Radeon 7 ??? I would like to see all those MI50/60 sales numbers you all have that drives you to such conclusions. Also, if they would sell the top model at $600 they would have to sell the lower model lower than $499 (RTX 2070) and the lower model lower than $349 (RTX2060). I don't even know anymore if you are for AMD or against AMD, honestly. You still expect AMD to sacrifice margins/revenues for products that it seems the market isn't even asking for? Even going by your own poll, only 3/19 people would buy it. I'd be interested to see if your poll removed "yes make it" and just conflated it with "I'd buy it." If those that voted for "yes make it" would then pick the "I'd buy it" option. You still expect AMD to sacrifice margins/revenues for products that it seems the market isn't even asking for? Even going by your own poll, only 3/19 people would buy it. I dont believe you get this, the poll is multi-choice enable. That means multiple choices from each voter. As of now, there are not 19 individual voters but 9 that would like to see a Vega II Nano and 7 that wouldn't. This means that at least 16 is your current TAM, and out for those, 3 would actually buy this product meaning almost 20% of the TAM would buy the product. This is a huge number. I'm saying that demand is high enough on the pro/AI end of the market that AMD would be insane to shift good MI50 dice towards a lower-end product. We already saw AMD short us on RXVega64 supplies early in the product lifecycle for this reason, AND it was a miracle that they even sold us Radeon VII (in apparently very small quantities) again for this reason. If you can somehow prove that MI50 cards are sitting on shelves due to lackluster demand, then go right ahead. I'll stick by my assertion that such products are selling like hotcakes early in their lifecycle. RX Vega 64 went through the same issue irrespective of the mining craze. There is a reason why it took so long to bring a considerable supply of Vegas to the consumer market at reasonable prices. Sure, you can get one today for less than $400. It's because they're finally obsolete! If you want AMD to be able to comfortable sell Vega II Nanos you would have to wait until 2020/2021 or so. Why would you make it multiple choice? If it had 100% "Yes make it" to 20% "yes we'll buy it" that's more of a reason to price it over $500. I wonder how votes would change if it followed more the original Nano, same price as Radeon 7.